The second of the Egyptian God Cards is unleashed! Using one of his brainwashed pawns to fight for him, the mysterious Marik traps Yugi in a deadly cage match against one of the most powerful cards in the world…Slifer the Sky Dragon! Then, duels rage around Battle City, and up first, Jonouchi fights Ryota Kajiki, Duelist of the Sea, on his home turf at the Domino City Aquarium! 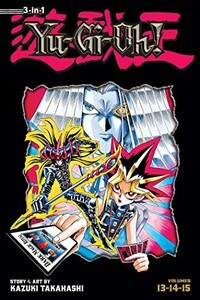 Then Marik’s henchmen, the Rare Hunters, force Kaiba and Yugi into a tag-team duel on top of a skyscraper! But the worst is yet to come when Mai and Jonouchi become possessed by Marik! Now, Yugi must fight Marik’s mind inside Jonouchi’s body. And the rules of this duel say only the the winner comes out alive. Collects volumes 13-15 in omnibus format.